LET THE GAMES BEGIN! 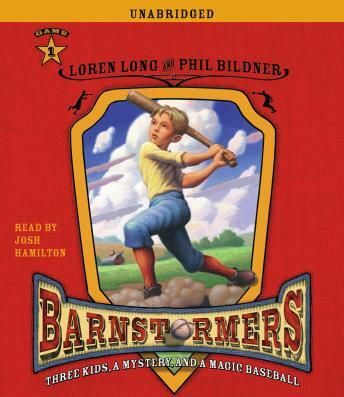 #1 NEW YORK TIMES BESTSELLER LOREN LONG AND TEXAS BLUEBONNET AWARD WINNER PHIL BILDNER CREATE AN ACTION-PACKED PARABLE WHEREIN THREE SIBLINGS EMBARK ON AN ADVENTURE OF A LIFETIME AND DISCOVER THE STRENGTH IN FAMILY, THE POWER OF FAITH, AND THE TRUE MAGIC OF BASEBALL. The year is 1899, and the Travelin' Nine are criss-crossing the good ol' U.S. of A., raising money to pay off the Payne family's big-league debt! Griffith knows the most about his family's troubles. So it's his job to set things right, because that's what his father would have done. Ruby has noticed a change in her big brother. Suddenly he's acting anxious and secretive, and she's determined to find out why. Graham just wants to hit the field. Deep down inside, he knows that everything would be fine if his brother and sister would let him step up to the plate and swing for the fences. And then there's the baseball that, when held simultaneously by Griffith, Ruby, and Graham, triggers the miraculous. Loren Long is the #1 New York Times bestselling illustrator of Madonna's Mr. Peabody's Apples and Watty Piper's The Little Engine That Could. His first picture book, Angela Johnson's I Dream of Trains, won the SCBWI's Golden Kite Award for picture book illustration. His version of Walt Whitman's 'When I Heard the Learn'd Astronomer' was a Golden Kite Honor Book. A former vintage ballist, he lives in West Chester, Ohio. You can visit Loren at www.lorenlong.com. Phil Bildner is the author of the Texas Bluebonnet Award-winning Shoeless Joe & Black Betsy and its companion, The Shot Heard 'Round the World; Twenty-One Elephants, which was an Oppenheim Toy Portfolio Platinum Award winner; and The Greatest Game Ever Played. In addition, he is the author of the teen novels Playing the Field and Busted. A devoted softball player, he lives in Brooklyn, New York. You can visit Phil at www.philbildner.com. Josh Hamilton's films include Kicking and Screaming, The House of Yes, Alive, Diggers, Online, and Outsourced. New York Stage work includes The Coast of Utopia, HurlyBurly, Proof, This is Our Youth, The Waverly Gallery, The Cider House Rules, As Bees in Honey Drown, and Suburbia.